Chief inspector of the specialized battalion of the road patrol police died in southern Kazakhstan after a shooting the previous day described by the president as a terrorist act, according to Almaty city police. 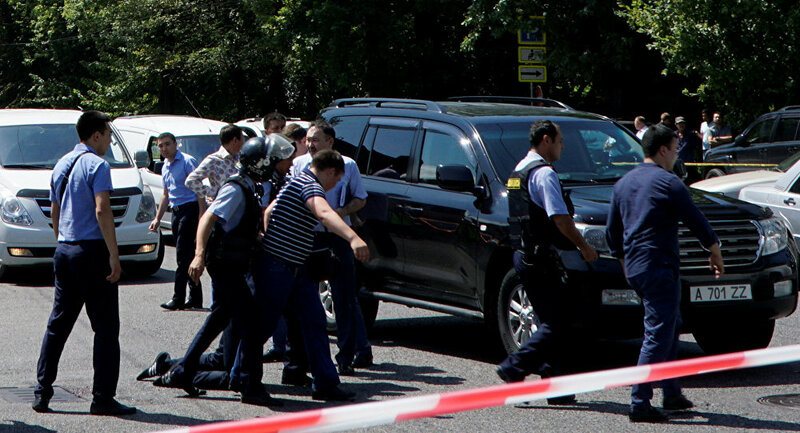 ALMATY (Sputnik) – A police officer died in southern Kazakhstan after a shooting the previous day described by the president as a terrorist act, bringing the death toll from the attack to six people, Almaty city police said in a statement Tuesday. "Chief inspector of the specialized battalion of the road patrol police Lieutenant Timur Begasilov died today in the intensive care unit of a hospital emergency room," Almaty police said in a statement. The country's National Security Committee (NSC) said that the detained suspect of the attack served time in prison where he maintained ties with members of the Salafi-jihadist movement. The Kazakh Health Ministry said at the time that eight people have been hospitalized in grave condition after the early Monday shooting.